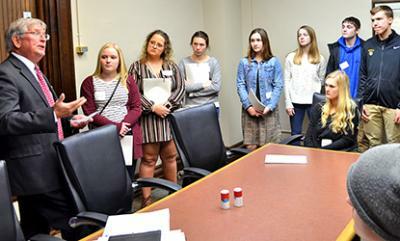 McLeod County invited students from the county area — including GSL, Hutchinson and home-schooled students — to take part in a day of government Tuesday, April 2. Starting at 8 a.m., students were treated to breakfast, sat through a county board meeting, and were taken on tours of various McLeod County facilities, among other activities. Above, County Attorney Michael Junge, who spoke to students about what it takes to be in his position. Shortly after, students sat in District Court Judge Jody Winters’ courtroom for a presentation and questions.